Fresh Chilly Pickle or Marcha nu athanu | Authentic Vegetarian Recipes | Traditional Indian Food | Step-by-Step Recipes | Give Me Some Spice! Indian Food is never complete unless it is accompanies by the extras like chatni, raita, papad, lassi etc. It’s believed that these foods help to balance the taste of food on your plate. I often make fresh pickle by adding basic spice mixture to fresh chillies, carrots, mangoes or gunda ( called Bird Lime in English) . You can buy ready made spice mixture in the Indian grocery stores. However, I feel that mixing and grinding your own spice mixture always tastes great as it’s freshly made. 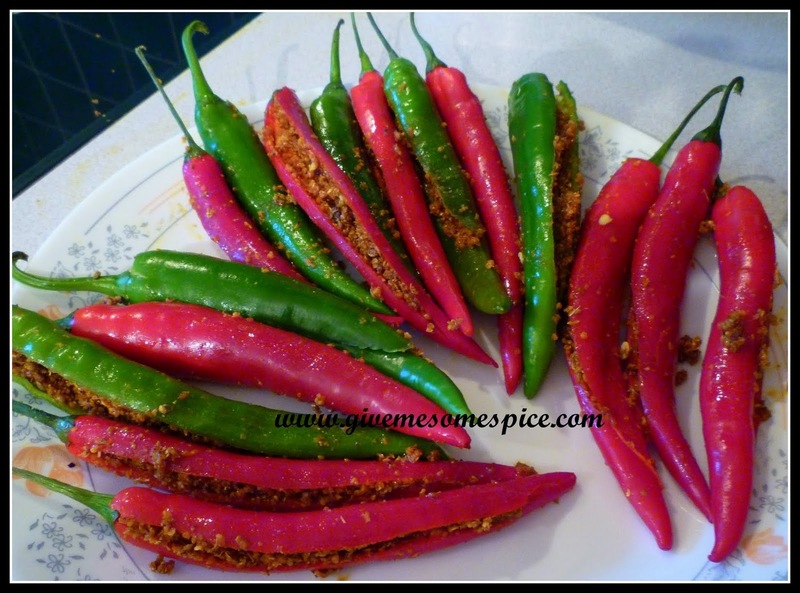 This Fresh Chilly Pickle or Marcha nu athanu is quick to make and tastes great with any meal. 1 teaspoons salt ( you can add a bit more if you like more salt). You will also need a selection of fresh green and red long chillies. 2. Transfer this to a mixing bowl and add the salt to the mixture. 3. Heat the oil in a saucepan and pour about 3-4 tablespoons over the mixture of spices. The mixture texture should not be too runny. 4. Mix all the spices with a spoon and allow to cool. 5. Whilst the oil is cooling, prepare the chillies. 6. Wash and cut the chillies length wise. Leave the storks on the chillies. 7. Stuff the chillies with the spices. 9. You can start eating yourFresh Chilly Pickle or Marcha nu athanu from the second day and it should stay fresh up to a fortnight.